Visiting Washington DC in the spring-time was a trip to remember. This year the Wyke cross-college trip was scheduled later in the year, the weather was mild and the iconic cherry blossom trees were in full bloom, as twenty five politics and history students toured Washington DC. Over the six day break, the group visited all the key monuments, historical sites, educational establishments and political institutions. The Lincoln Memorial and the Martin Luther King Memorial, the White House, Georgetown University, the Smithsonian Museums, Arlington Cemetery and Capitol Hill, were all visited in a packed itinerary. The entire trip linked into the A level syllabus, a point that was constantly referenced throughout the tour. James Goodchild, A Level History teacher and John Whitaker, A Level Government & Politics teacher, took it in turns to deliver mini-lectures at all the landmarks. The visit to the Capitol Building was especially rewarding as the Senate was in-session, giving the students the opportunity to observe American politics in action. It wasn’t all museum, landmark and statue. 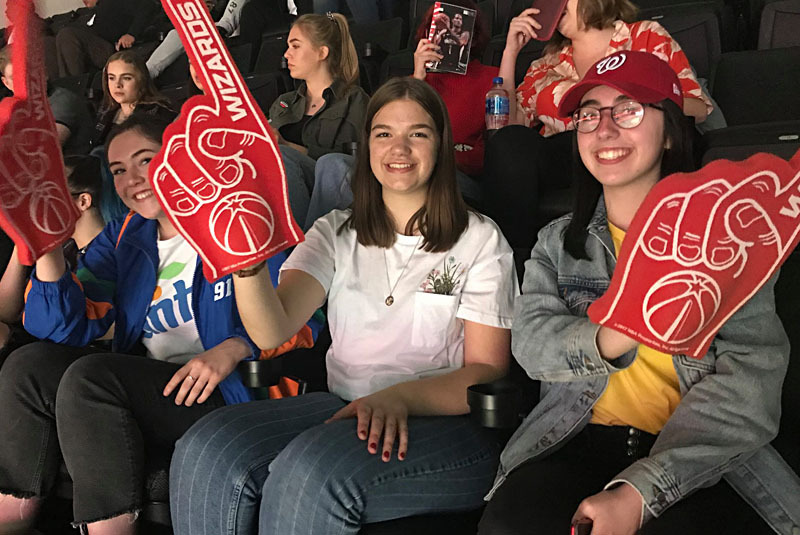 Following the success of last year, the group booked in to watch the Washington Wizards basketball game and others went to see an intense baseball match at the newly renovated National’s Park stadium. Add to this there was even time for shopping at the enormous Pentagon Mall. To see more of Washington DC 2019, search Wyke Washington DC on Instagram. Planning is already underway for 2020. 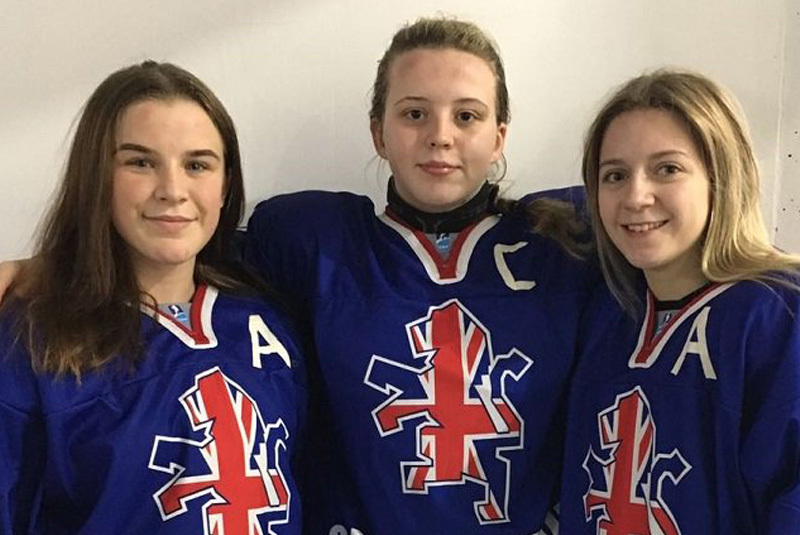 Kiana Tait will be putting her college work briefly “on ice” in 2019 as she has been selected to represent Team GB Ice Hockey at U18 level. Each year, Wyke provides a valuable stepping stone for those wishing to secure places at these prestigious universities. In 2018, we celebrated a record number of students in doing so, with 9 students going on to study a wide variety of courses from Law to Biomedical Science. The successful students came from state schools all across Hull, East Riding and North Lincolnshire from a variety of socio-economic backgrounds. This exceptional outcome is a combined result of fantastic students working with excellent A Level specialist teacher’s in an outstanding college. We also have a dedicated Flyers Programme to help support students aspiring to Oxbridge and Russell Group universities. In the current environment, were top universities tend to favour students from private schools and particular parts of the UK, this is demonstration that Wyke, an inclusive sixth form provider is going above and beyond in supporting all students in achieving their potential. 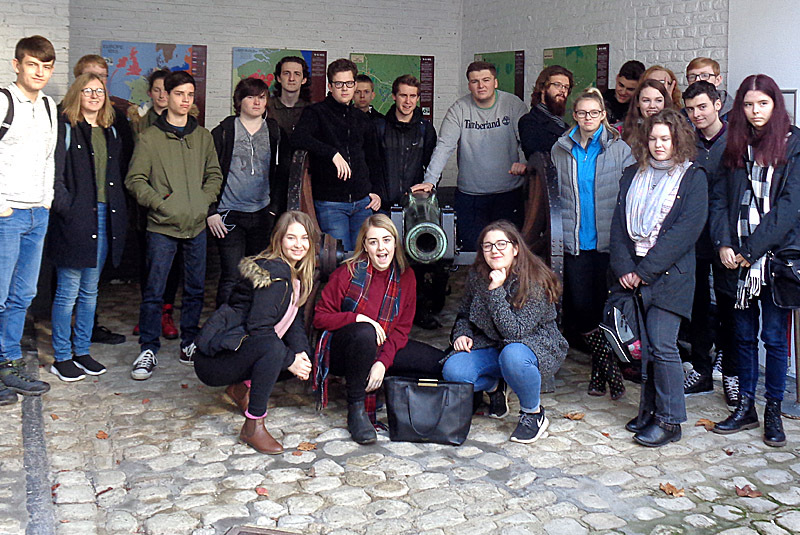 After last years successful visit to Belgium, the History department are organising another trip to the Flemish countryside to include next years first year students. James Goodchild, Head of History at Wyke, is taking deposits of £75 from current students who want to be on the three day visit. The total cost is estimated to be £295. The tour takes in some of the most famous sites from World War One, including Ypres and Vimy Ridge. The visit also extends to the Napoleonic Wars, visiting the Hougoumont farmhouse, a key location from the Battle of Waterloo. Contact James Goodchild by email at james.goodchild@wyke.ac.uk for further information. There is also a pdf handout with details of the itinerary, travel and accommodation to download. Yet again, students at Wyke Sixth Form College have shown a combination of talent and hard work to achieve outstanding success. This, combined with superb teaching and the best possible facilities, has meant that 99.6% of students have achieved a pass grade at A-level with 29 subjects achieving 100% pass rate. 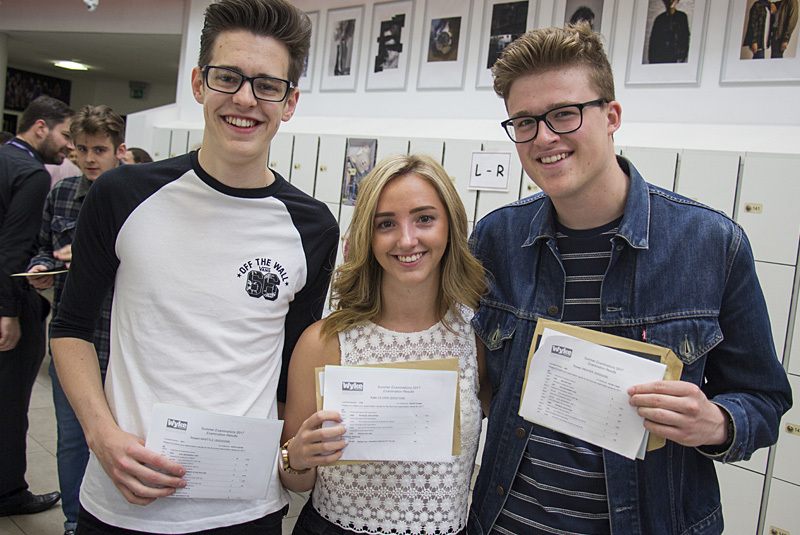 At A-level, we have had an increase in the proportion of students achieving the much coveted A* grade (97 students), and the proportion achieving A*- B grades has increased to 47%. Once again our BTEC results were outstanding with 62 students achieving 3 triple Distinctions in comparison to 31 students in 2016. 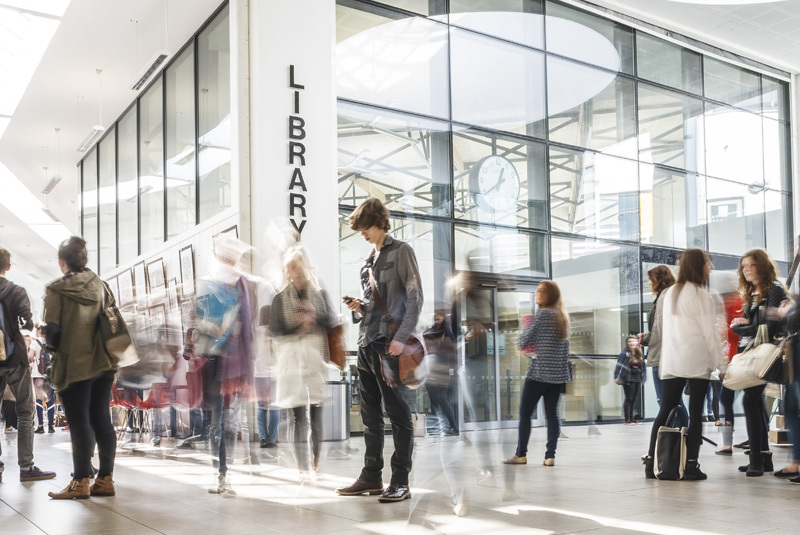 “In a year in which there has been so much curriculum change, these are another set of excellent results for our College. They reflect the tremendous work of all of our staff and it is a pleasure to be able to work with such wonderful students. The care, support and guidance offered at Wyke continues to be outstanding. I would also like to thank parents for their unstinting dedication. The staff at Wyke consistently show their expertise in bringing the best out of each and every student. Sixth Form students are our sole focus and the students at Wyke show what can be achieved when the right teaching, support and facilities are there for them. As one of the largest A-level providers in the region, I am absolutely delighted with the large number of students achieving the top grades and I know that our College will continue to provide the best possible education for the widest range of young people. We have consistently shown what can be done in the city. It is an engine of confidence and achievement for the future. A visually stunning retrospective exhibition reflecting Hull’s fight against racism is being held at Wyke in March. The original silkscreen posters, designed by Richard Lees, for Hull Rock Against Racism 1979-82, are being hung on the Learning Street corridor of the Oak building. “This Is Hull!” presents a body of work in the revolutionary tradition of German Expressionism, Soviet Constructivism and Paris 68 Atelier Populaire. Alongside the screen prints will be a student response entitled “Fifty Protest Songs”, a series of framed images produced by the Wyke A level Graphic Design course. Hull Rock Against Racism got started in 1979 when community activists, grassroots anti-racist campaigners and musicians came together to promote regular RAR gigs with local bands in the heart of West Hull. With production runs of around 250 , Richard Lees’ silkscreen posters were fly-posted all over Hull, often in blocks of 4 -8 posters per site, creating a powerful and sustained anti-racist street art presence in the city, just as important as the events they promoted. The bands and the community centre have gone but the posters are reaching out to new audiences: with six on permanent display at Hull’s Wilberforce House Museum, the whole lot are on a UK tour, to Manchester’s People’s History Museum, London’s Rich Mix, Edinburgh’s Summerhall and now at Wyke Sixth Form College. Further details of a private view and public access will be available shortly through our Facebook page.